Mattycollectors Facebook Page has been updated with a surprise new Ghostbusters set. 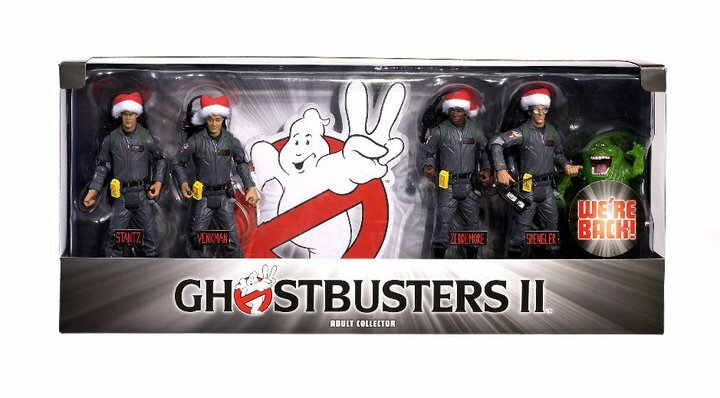 The Ghostbusters 2 Holiday Boxset includes all four main characters as 6″ figures. 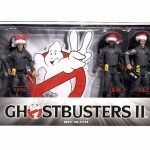 They include removable Santa hats, a Slimer and a ghost trap. The set is due out by the holiday season and will be exclusive to Toys “R” Us. Any word on price? I'm guessing around $80. I'm torn on this one. 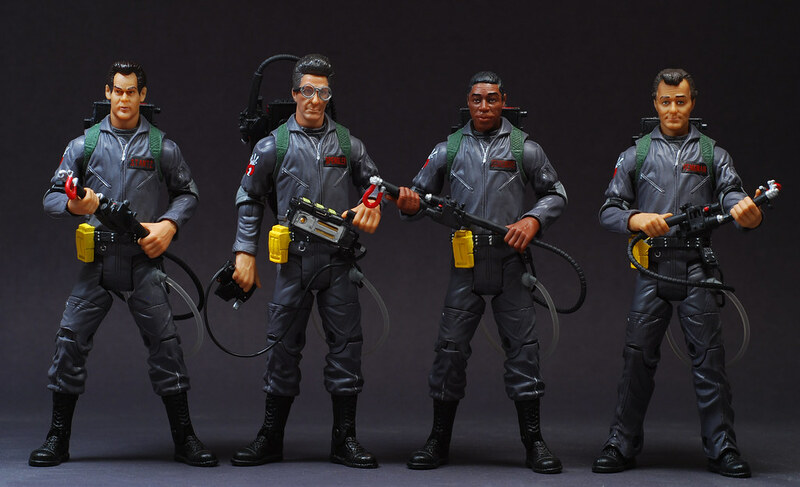 On one hand I don't want to shell out the dough for repaints, but on the other hand I want them really bad because I frickin' love Ghostbusters! Unfortunately, no price was listed. This WILL be bought. I don't have any of the Figures as I HATE dealing with Matty so this is a no brainer. I can't remember where but I heard this was going to be $50. I don't care too much for the darker suits, but this is probably one of those things where you see it at the stores often, and think maybe you'll get it but then never do. Then when you dont see it anymore you're kicking yourself for not buying it in the first place. want, but wish the blowers were included. $50 or so retail would be okay. I hate when I do that! I try and not do that anymore and usually buy something I want asap. Sometimes I take a gamble and wait to see it it will go on clearance, but you can never be completely sure what will hang out on the shelves for a while and what will disappear. Best bet is to buy on sight. It good to see more of these collector focused figures getting a retail release. Hopefully it sells well so we can continue to receive more stuff like this at TRU. And hopefully we see this one in Canada. This is one of the sets that I would buy on sight for sure. I kinda like the darker suits, but I do wish they came with the blowers. It was such an iconic moment for that movie. Agreed. Hopefully, it will give TRU incentive to carry more collector-oriented lines and exclusives. Me too. I missed out on the original release of the GB line on Matty, and now they are too expensive on Ebay. Plus, I hate that some are slimed, some are not slimed, etc. I'll definitely get this set without thinking twice. Nice looking set right there! Yeah, if they don't make it to Canada I may have to resort to Ebay or an online store...but that sounds expensive already. Found this set today at Toys R Us, $59.99. They had a CRAP LOAD of them on the shelf. Haven't had a chance yet to open them, but they look cool. A little pricey, especially since they don't come with accessories like the single figures do, but I guess that's why they're charging about $15 per figure. Oh well, I'm a sucker for Ghostbusters. Excellent pic man, what do you think of this set of figures compared to previous releases? These are the only ones I own. Love them though. I wasn't going to spend the time and crazy money to track down previous versions, so finding this set at random was a godsend for me. I'm glad they released this at retail or else I never would have owned any of them. Dammit, stop making me regret not picking these up!! !